1.1 How do I use this capability? JReviews' code override functionality allows you to override any file located in the JReviews application folder. The most common way to upgrade a component in Joomla is to uninstall it and then re-install it. This means that any code changes you might have made to the JReviews core files could be lost if you don't have a back-up; it is also more difficult to keep track of the files that you've customized. With the code override functionality you can place your customized files in a folder outside of the JReviews component/plugin to keep all your customizations in one place and safe from upgrade losses. Of course, you still need to check for file differences when there's an upgrade because there might be bug fixes in your modified files, but now you can easily keep track of which files to check. How do I use this capability? Easy! Just create a new 'jreviews_overrides' folder. In both cases the 'jreviews_overrides' folder is the equivalent of the 'jreviews' application folder and most files can be overridden using the same structure. Read the Default theme overview to learn the file structure. Important: your custom theme must have a unique name, don't name it the same as one of the existing themes and the folder name must be all lowercase. 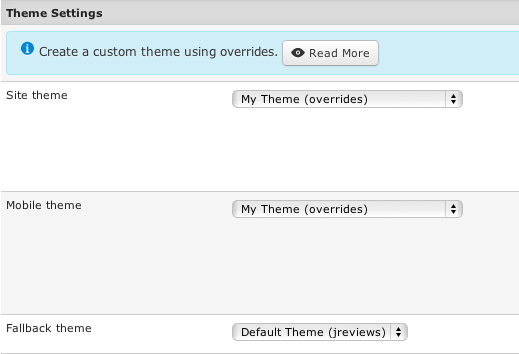 After this step, clear the JReviews registry, then select your new theme in the JReviews Configuration. 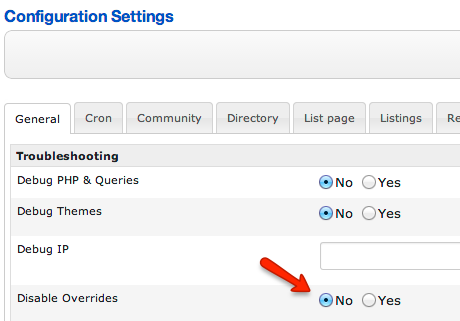 Important: do NOT copy all files from the /default theme to your new overrides them. Only copy the files that you want to modify. And then add only the images you want to modify there. The rest of the images will be loaded from the default theme. You only need to add one in this folder named custom_styles.css. In this file you will add the CSS class overrides instead of copying the entire contents of the core CSS files. Important: after you are done adding files to your custom theme, for JReviews to recognize new files, you must click the 'Clear Cache & File Registry' link in JReviews Administration and select your new Theme in the Configuration, General tab. When you make modifications to the theme files, but the modifications aren't visible on the site, you probably need to clear the browser's cache to see the changes (in some cases it will be necessary to clear cache in JReviews and Joomla also). Note: Fallback Theme dropdown must always be set to Default theme so that the files that don't exist in your custom theme are loaded from the default theme. If you want to modify the files that exist in those themes of add-ons, copy those files into your custom JReviews theme the same as if they existed in the default theme folder. Some of the add-ons have their own CSS files as well, but you should never customize those or copy them to your custom theme. Instead, copy specific CSS styles that you want to customize into the custom_styles.css file in your JReviews theme and adjust the styles there. It is recommended not to make too many modifications to the JReviews core files, in order to make future upgrades easier; but you can do them the same way as when modifying theme files. The framework will always check in the jreviews_overrides folder first to see if the file is there and if found it will use it instead of the core file. Keep in mind that anytime you add a file to the overrides folder you need to clear the File Registry in the JReviews administration. Doing this allows JReviews to recognize the new file. Otherwise, it will continue reading the file from the main component folder.